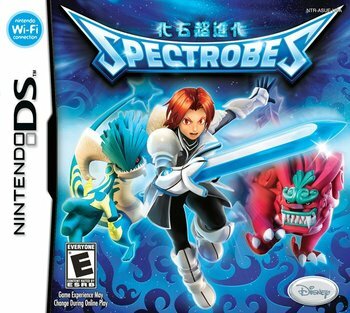 Spectrobes is an action-adventure take on the Mons genre developed by Jupiter and published by Disney Interactive Studios as their first game not based on an existing property. It features the main character, Rallen, a space police agent, and his partner Jeena, as they attempt to save their home from the Krawl, alien invaders who travel around in reality warping black tornadoes. With the help of the Prizmod Rallen will awaken the fossilized Spectrobes to do battle against the Krawl. It spawned two sequels, Spectrobes: Beyond the Portals in 2008 and Spectrobes: Origins in 2009. Aerith and Bob: The main character's name is Rallen. His commander's name is Grant. His Spectrobe mentor is Aldous. And the weapons salesmen is... Dave. Ascended Extra: The weapons salesmen? Yeah, his name's Dave. Awesome, but Impractical: The Sword, which generally does 1 damage to any decent Krawl. However it becomes practical in Spectrobes Origins because Rallen and Jeena's weapons can now do good damage to Krawl as well. Bag of Spilling: Yeah, all the stuff you got in the first game, say buh-bye. You even lose Aldous and Tindera for crying out loud! And the ancient ship, too. Battle in the Rain: Rallen's first fight with the Spectrobes. Sadly, it's only raining in the outside world. Big Bad: Krux, a fallen Spectrobes master. Big Damn Heroes: Tindera at the end of Portals. Rallen's Catchphrase. See Gratuitous Japanese. "Nanairo", the name of the star system where the first two games take place, can be translated as "Seven Colors" in Japanese. Rallen actually indirectly points this out in Portals, because the star in Nanairo really does shine in seven different colors. Fubuki, another star system in the first sequel, means "blizzard". Fitting as the system itself has no sun, and the only planet in it, Hyoga, is mostly ice (the "hyo" in Hyoga also means "ice"). Meido, the epicenter of the Krawl outbreak in the first game, is the Land of the Dead in Buddhism. A lot of the Spectrobes' names have Japanese meanings or roots. Example: "Komainu" can mean "lion dog", and a komainu is a creature in Japanese mythology that protects shrines. Bonus Boss: Origins has the Legendary Krawl Darkroe, which can only be fought after beating the game once. Casting a Shadow: Jado's shadow is alive, and fights along with him. Cat Folk: The secret card-only Cat's Paw weapons in Origins make Rallen and Jenna gain cat ears and paws. Rallen's are brown, while Jeena has pink ears that match her pink hair. Chosen One: Rallen is the only one who can wake the Spectrobes. Even though others can use them. Continuity Nod: After you obtain the Ancient Ship in the first game, it becomes apparent that the NPP is actively reverse engineering it. In Portals you can purchase parts that make your ship basically a modern version of it, and Rallen and Jeena's patrol cruiser and Commander Grant's in Origins have the same design. Cutscene Power to the Max: Rallen, at the end of Portals, does some sort of Diagonal Cut to Krux, defeating the most powerful being in the universe... for now. Dark Is Not Evil: In a surprise for Disney, you can use Dark Spectrobes, which are pretty much PaletteSwapped versions of other Spectrobes, with a bit more strength. Oh, and even more surprising you have to use Dark Spectrobes to beat the game. Demoted to Extra: Aldous plays a pivotal role in the first game, but by Portals he is just a supporting character who goes missing for most of the plot, and there's no mention of him at all in Origins. Department of Redundancy Department: "Let's do this, Iku Ze!" Drop-In-Drop-Out Multiplayer: In Origins, a second player can join in and play the Spectrobe. Oddly, despite that the game's Cosmolink device comes in two parts (with Rallen and Jeena sharing it), you can't have a Rallen/Jeena tag-team. Dueling Games: With Fossil Fighters. Easy Levels, Hard Bosses: In Spectrobes Origins the bosses are much more difficult than the levels that come before them especially if you don't do Level Grinding. Normal enemies don't have complicated attack patterns but bosses have them, bosses can also attack very fast and some of them will also spam attacks that will constantly stun you. If you don't level grind or make strong Spectrobes to match your level the bosses will probably defeat almost all your entire team. Flash beats Corona, which beats Aurora, which in turn beats Flash. An intro to this becomes, in an annoying fashion, the first half of Portals. Even though knowing the type advantages does absolutely nothing in the second half. And in Origins, Fire beats Plant, which beats Earth, which Beats Sky, which beats Water, which beats Fire. This is a bit more relevant as each location has a predominant property and enemies with such property, but some of the stronger enemies are still property-neutral. Fake Longevity: Origins give you the option to play the game again after you finish it, and reviving all the bosses, making them and the normal enemies stronger. Fallen Hero: Krux was formerly a Spectrobe Master. Fetch Quest: A particularly arduous one involves collecting the three keystones. Also raises the question of what Cyrus needs the Blue Keystone for. Cyrus is pretty bad about these really. In Portals, the doomed civilization of the planet Nox left behind the "Dynalium" a weapon that could potentially be used against the Krawl, with the hopes that if another set of humans were to discover it, they could use it to succeed where they failed. Aldous himself counts as one. Fossil Revival: The basic premise. Unique in that the method of revival used in this series is based on sound. Gameplay and Story Segregation: One cutscene shows Pegatinum flying artfully at high speeds while firing lasers at Zabacraw, the Ancient Krawl. In actual gameplay it has no such attacks and can only run or glide just above the ground. Gang Up on the Human: Subverted in most cases, as the Krawl will generally attack whatever's closest to them regardless of whether it's Rallen/Jeena or a Spectrobe. While not ganging up per se, it's played straight during the fight with Krux in Origins. Whether or not your Spectrobe is controlled by the A.I. or a second player, Krux will only pay it mind if it gets in his way. He's coming for Rallen/Jeena specifically. A lot of the names for things such as planets and star systems feature this. Happy Dance: In Origins, child Spectrobes will do a little dance any time they unearth a fossil, and a (different) little dance (accompanied by a music note) any time they unearth three or more items simultaneously. Professor Wright might count on some level. Jeena, your sidekick, though she's more a Wrench Wench than scientist. Idiot Hero: Rallen barely managed to pass pre-algebra, and his social tact is a bit lacking. Immune to Flinching: In Origins, you cannot be flinched out of an attack when wielding an axe-type weapon. This is balanced by the sheer amount of time required to swing the axe and connect the hit. Knockback: Glove-type weaponry specifically knocks Krawl up, down, or back — any of which is enough to disperse a crowd of enemies to take them on in reduced numbers. Level Grinding: You can spend hours in the Hurricanes leveling up your Spectrobes. Long-Range Fighter: Kugaster, the Darucho line, and Azamaros are all this trope. They become particularly broken when combined with Close-Range Combatant Spectrobes. Mission Control: Jeena, save for Origins where you have the option of playing (and fighting) as her. Goblada, the final boss of the first game, comes back for more after you beat it the first time. Jado comes back twice over the course of Portals and Origins, and that still isn't enough to finish him! Olympus Mons: The Ultimate Form Spectrobes. Able to completely decimate lower-level Krawl and still significantly injure stronger ones. It's not an uncommon tactic when searching for fossils or minerals to just equip a Geo and use it whenever you get sucked into a battle. One-Winged Angel: Each of the High Krawl under Krux have a more monstrous, appropriately Krawl-like form that they assume when you battle them. Special mention goes to Jado, who has three. Out-of-Character Moment: Webster has one of these towards the end of Portals. Phlebotinum Breakdown: One of the first things that happens in Origins is that, after arriving in an unknown star system and answering a distress call from the planet Wyterra, Rallen discovers his Prizmod isn't working; he can't summon his usual Spectrobes to take on the Krawl. Fortunately for the player, Rallen and Jeena acquire a new device (the Cosmolink) which provides the same functionality. Platonic Life-Partners: Rallen and Jeena are friends and obviously they work together but they do not have feelings for one another. They do hug at the end of Spectrobes Origins because they might not see each other again but it's a Bro Hug. Prehensile Hair: Maja, from Portals. The hair to one side of her head becomes infinitely long and can impale objects while not leaving any mark in said object. In fact, in one webisode she tries to strangle Rallen with her hair. Rare Candy: While feeding Spectrobes minerals is a requirement to evolve them in the first two games, in Origins each mineral merely provides boosts of EXP to the Spectrobe eating it. It also has minerals to increase the Spectrobe's HP, Attack, and Defense. Red Shirt Army: The NPP officers, except Rallen. Sand Worm: Origins has Zabacraw, a gargantuan Krawl sand fish. Starter Mon: Each game gives you three starters: Two for combat and one child to dig with. In each game, you'll also get at least one member of the Komainu family somewhere in your starter pack, as Komainu is the Series Mascot. Swiss Army Appendage: The gauntlet on Rallen's right arm seems to be compatible with all sorts of technology. It even has a slot in it shaped exactly like the Prizmod, even though there's no conceivable reason why he would need such a slot. Token Minority: Professor Kate, the sole black character in the series. Voice with an Internet Connection: Jeena, until Portals. Wrench Wench: Jeena, although technically a tech wench.